I suspect you think that we Mistresses, when not wielding the cane, are sitting around sipping champagne and getting our nails done. Au contraire. For a number of years now the I.S.S. (Institute of Sadistic Sciences) has been carrying out research into the area of P.I.T. (Pain Intensification Technology). Whilst CERN has concerning itself with the collision of particles, the I.S.S. top secret Swiss research laboratory has been focusing its attention on collisions of the leather and skin variety. We now feel it is time to reveal some of our findings to the world. Just in case you were ever deluded enough to think that we ladies don’t mean business when it comes to causing necessary pain and suffering to difficult and naughty boys. Here at I.S.S. we are great believers that P.I.T. techniques need not cost the earth and that by making use of items regularly found around the house they can also be eco-friendly! Recent research at the I.S.S. lab has, therefore, been focused around a number of liquids found in the domestic environment; H20 (water), Ethylene glycol (anti freeze) and Tabasco Sauce. Rigorous testing at the laboratory’s Pain Suites has proved that simple combinations of these liquids, placed in sub zero conditions until solidified, can prove most effective when applied to the male genitalia. Particularly if said male is firmly restrained and blindfolded and has been subjected to the Nasty Scissors beforehand. Most interestingly thanks to the heat transfer between the testicles and ice cube our technicians were able to observe that the test subjects experienced intense coldness/ pain even after the cube had considerably melted. The results of our tests are detailed in the graph below. Please note that these techniques should only be carried out by the fully initiated AS THESE ACTIVITIES POSE A HIGH RISK OF FROSTBITE! 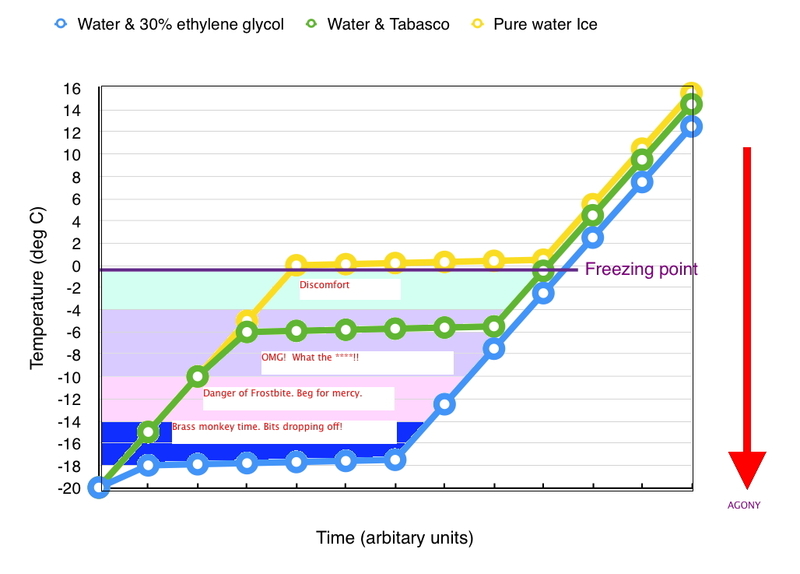 Graph detailing impact of different ice compounds on balls over time. More findings from the I.S.S. soon. This entry was posted in Uncategorized on May 13, 2014 by Miss Myers.